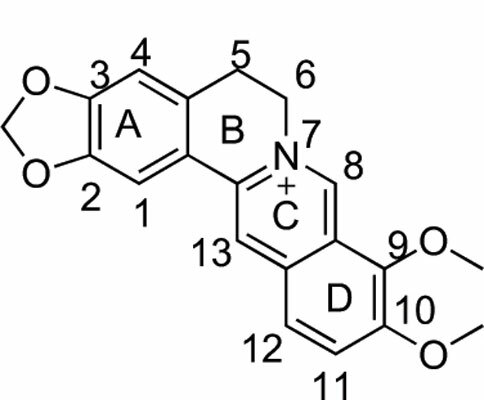 Berberine, a quaternary ammonium protoberberine alkaloid with an isoquinoline scaffold isolated from medicinal herbs, exhibits a wide spectrum of pharmacological activities. Berberine has been used in traditional Chinese medicine and Ayurvedic medicine. However, it has poor bioavailability, which seriously limits its application and development. The chemical transformation of natural products is an effective method to improve pharmacological activities. Researches have been carried out on the modification of berberine to obtain better pharmacological properties. In this paper, the structural modifications of berberine for different biological activities and its underlying mechanisms are reviewed. Keywords: Berberine, bioavailability, chemical transformation, mechanisms, pharmacological activities, structural modification. Keywords:Berberine, bioavailability, chemical transformation, mechanisms, pharmacological activities, structural modification. Abstract:Berberine, a quaternary ammonium protoberberine alkaloid with an isoquinoline scaffold isolated from medicinal herbs, exhibits a wide spectrum of pharmacological activities. Berberine has been used in traditional Chinese medicine and Ayurvedic medicine. However, it has poor bioavailability, which seriously limits its application and development. The chemical transformation of natural products is an effective method to improve pharmacological activities. Researches have been carried out on the modification of berberine to obtain better pharmacological properties. In this paper, the structural modifications of berberine for different biological activities and its underlying mechanisms are reviewed.